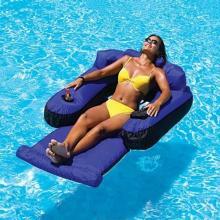 Comfort and value combine to bring you the EvaFloat SunChaser Lounger! The EvaFloat sling is made of high density, non-sticky foam that provides just the right amount of flotation for buoyancy and comfort...at a great price! 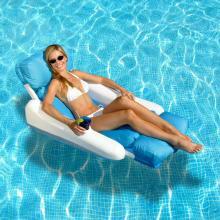 Discover the most comfortable floating lounge chair ever made! Our soft yet durable Sunsoft fabric in combination with our firmness adjustable inflation cushion makes for the most relaxing lounger over built! Molded frame and pontoon design. Featuring our full length padded cushion and extra pillow headrest. "U" frame and pontoon construction assembles in minutes! Molded frame and pontoon design. Comfortable woven sling with pillow. 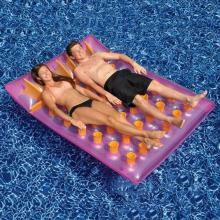 For hours of rest and relaxation in the pool. Quickest and easiest assembly! 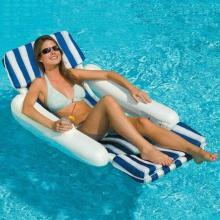 Nylon fabric covered inflatable lounge chair with head, arm and foot rests. The ultimate in comfort! Complete with drink holder. Great in or out of the pool. 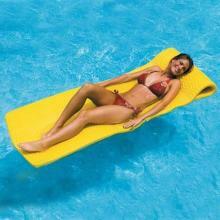 Soft, floating foam luxury mattress never needs inflation! Rolls up for easy storage! 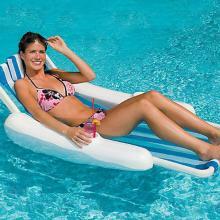 74" x 26" x 1.5"
Fabric hammock sling with inflatable covered head and foot rests. So cool! 78" Double French Mattress. French style 36 pocket 2 person double size air mattress. 76" French Mattress. 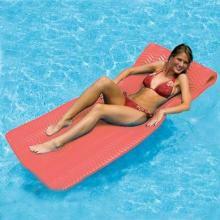 French style 18 pocket single person air mattress.